Celebrating 70 years! Great taste never goes out of style! Before Santa hurries down your chimney this year, make sure your holiday home is ready for the man in the red suit with simple and stylish updates. 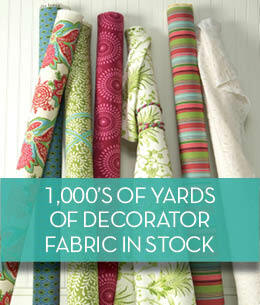 Fabric is fabulous, and the perfect way to perk up your home if it’s lacking the ‘fest’ in festive. And what’s wonderful about boosting your home’s holiday heart with fabric is the myriad of patterns, textures and styles. Fabric is effortless, affordable and highly customizable. Use it to enhance almost any space in your home. From small updates such as napkins and coasters, to grander statements like window and wall treatments. So much of holiday celebrations revolve around family and food. From novel napkins to matching table runners – bring the joy of the season to the table. Bold patterns and colors can also breathe new life into tired walls and lampshades. Large swaths of fabric can replace the glass in picture frames to provide vibrant texture for your walls. Cover several artist’s canvases or corkboards in your favorite fabric, then line them up above the head of your bed for a whole different take on the headboard. Lampshades make the perfect candidate for a splash of color from a swath of spirited fabric. Wrapping shades in the right fabric will allow your light to set the mood and bring a sparkle of holiday cheer. Your home’s look and feel can change with the seasons. Just like adding a few trendy new pieces to your wardrobe, updating décor can be simple and inexpensive when you consider all you can do with a few different fabrics. Would you like to schedule a Design Consultation? "Anita, I can't begin to thank you for your over-the-top service and design guidance! You are fabulous and I am soooo thankful for your patience while working with me...hour after hour! I know that I would never have selected such beautiful fabrics without your expertise. Kudos to you. As Arnold would say.... I'll be back."